← Blooming Marshmallows for Cocoa! Make your own! 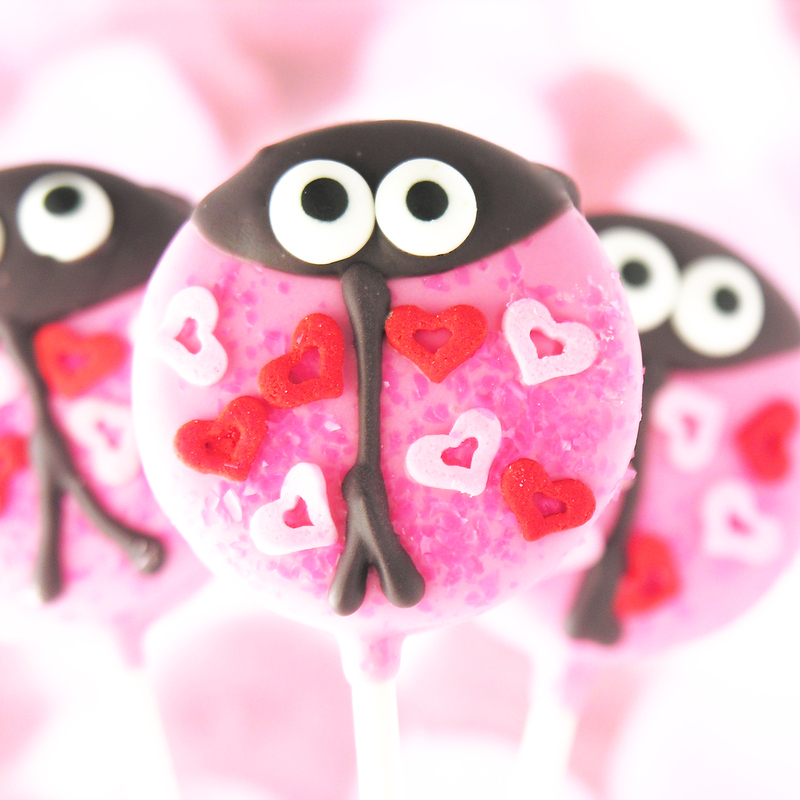 Show a little love this Valentine’s Day with these Oreo Love Bugs! Easy to make ahead and wrap up as gifts! 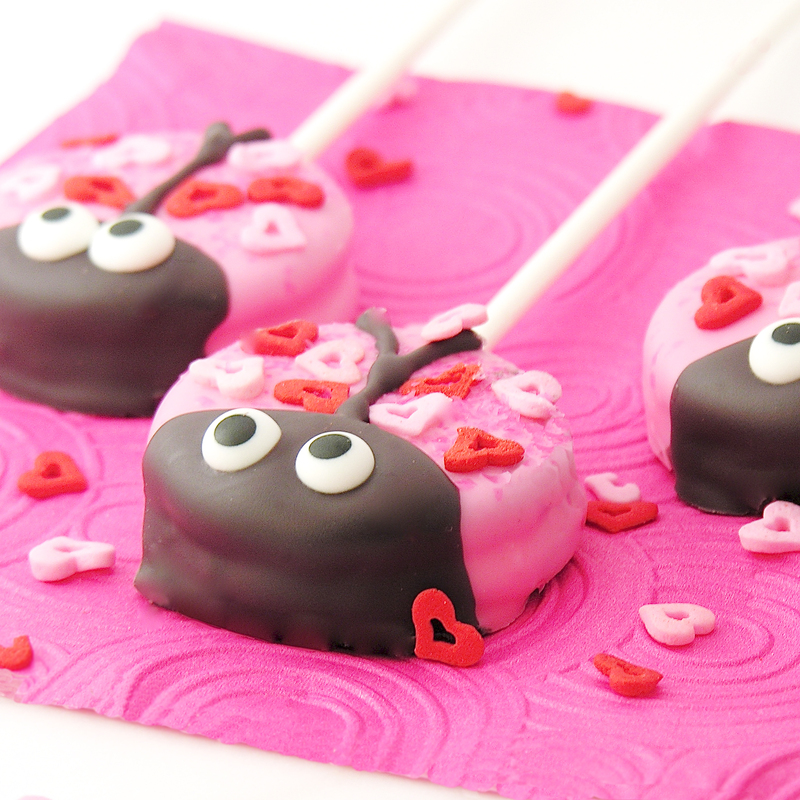 I just have to keep making Oreo Pops… there are so many possibilities and all of them are yummy and cute! I’ve pretty much failed at cake pops, but these? My favorite! 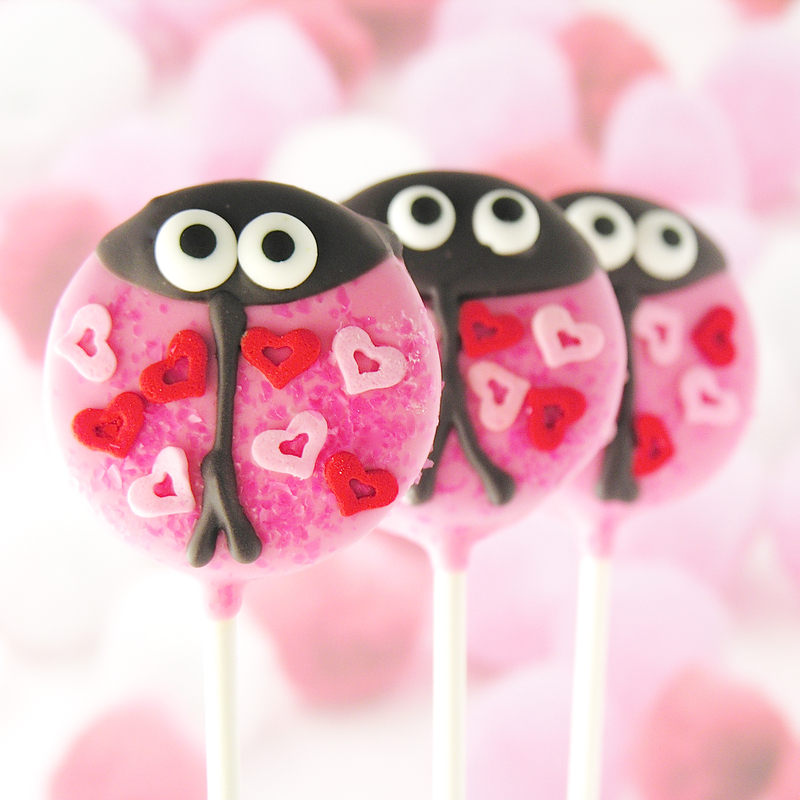 I made Lady Bugs Oreo Pops a couple of years ago, and when I was visiting Florida last month I was subjected to everyone’s horror stories about some awful little bug called a Love Bug. I guess people hate them down south, but when I heard “Love Bug” I immediately pictured these. 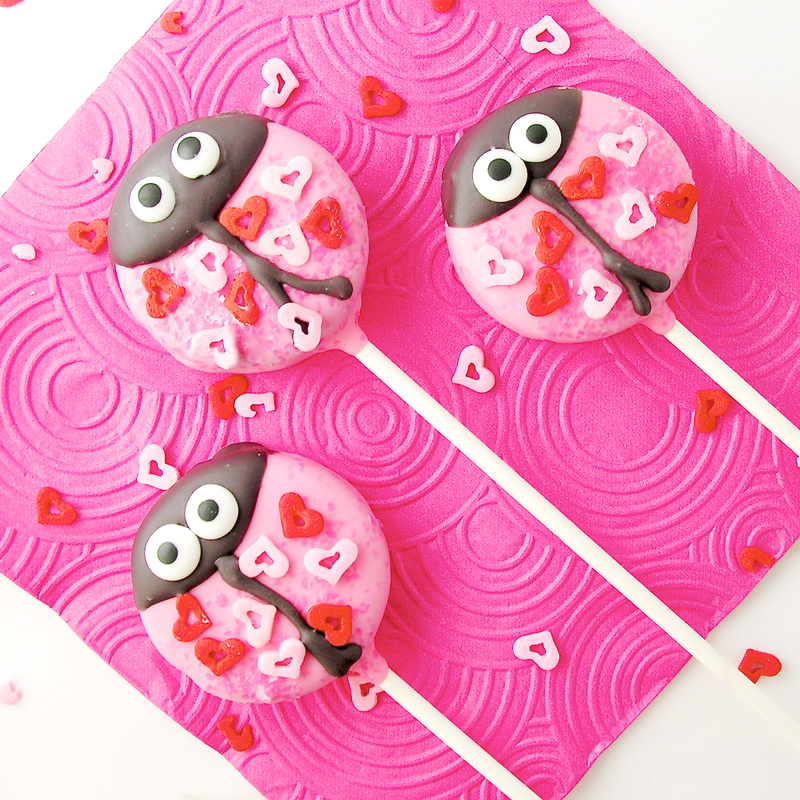 Sweet little pink bugs with hearts and sprinkles! Aren’t they fun? Cuteness overload….! These really aren’t hard to put together- especially if you’ve made Oreo Pops in the past. (If you haven’t ever made them, click here for a tutorial). Dip one end of a lollipop stick into the white chocolate, spread a little on the top of the white Oreo filling and then press the stick flat into the center of the filling. Melt pink candy melts in the microwave in 30 second increments, stirring between until melted and smooth. Have parchment paper spread on your countertop and have your sprinkles ready. 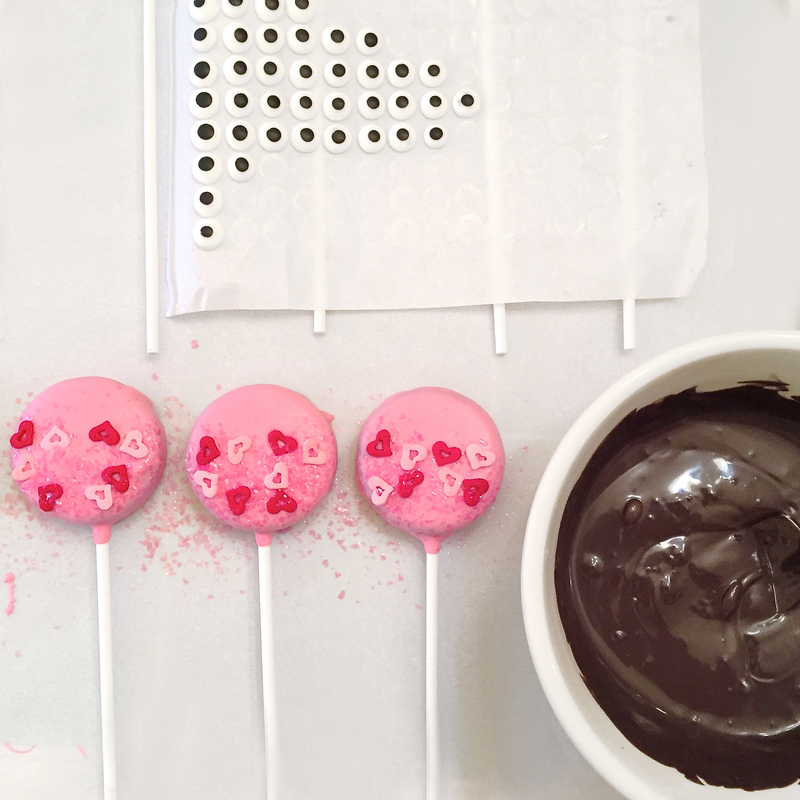 Dip an Oreo into the pink melts, spooning melts over top and sides. Tap on edge of bowl to get rid of excess and slide bottom of Oreo along edge of bowl to remove drips. Place on parchment paper and while melts are still soft, sprinkle with hearts and sugar or jimmies, leaving these OFF the top 1/3 of the cookie. Allow these to harden. Melt black candy melts in the microwave in 30 second increments, stirring between until melted and smooth. Spoon black melts over the top 1/4 of the cookie and then tap to remove excess and slide bottom across bowl edge to remove drips. Set on parchment paper and place two eyes on top. Once all heads and faces are done, spoon remaining black melts into a small zip-top bag. Clip a corner, and pipe a center line down the middle of the cookie as pictured. Allow Oreo pops to harden. Bag them up individually or store them in an air-tight container. Posted in Candy, Cookies and tagged bug cookies, easy valentines recipe, edible valentines, heart bugs, heart sprinkles, Holiday Oreo Pops, Love Bug cookies, Love Bug Oreos, Love Bugs, love cookies, Oreo dessert, Oreo Frogs, Oreo Pop ideas, oreo pops, oreo recipe, valentine cookies, Valentine frogs, valentine gifts, Valentines Day cookies, Valentines Oreo Pops. Bookmark the permalink.